Neptunium-239 was the first transuranium element produced synthetically and the first actinide series transuranium element discovered. This isotope has a beta-decay half-life of 2.3565 days, which forms daughter product plutonium-239 with a half-life of 24,000 years. There are 25 known radioactive isotopes of neptunium ranging in atomic weights from 225 to 244 with 5 of those as metastable isotopes. The most stable are Np-237 with a half-life of 2.14 million years; Np-236 with a half-life of 154,000 years; and Np-235 with a half-life of 396 days. All of the remaining isotopes have half-lives less than 4.5 days, with most less than 50 minutes. The primary decay mode for isotopes lighter than 237Np is by electron capture with a great deal of alpha emission. The products are mostly isotopes of uranium. The primary decay mode for Np-237 is by alpha-decay forming protactinium. The primary decay mode for the isotopes heavier than Np-237 is by beta-decay, forming plutonium. Neptunium-237, after decaying to protactinium then to uranium, eventually decays to form bismuth-209 and thallium-205. Unlike most other common heavy nuclei which decay to make isotopes of lead this decay chain is known as the neptunium series. 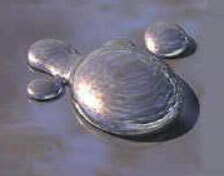 Neptunium has the largest liquid range of any element, 3363 K, between the metal melting point and boiling point. It is the most dense of all the actinides and the fifth most dense of all naturally occurring elements. Recently a neptunium-based superconductor alloy was discovered with formula NpPd5Al2. The occurrence of superconductivity in neptunium compounds is surprising because they often exhibit strong magnetism, which usually destroys superconductivity. Neptunium forms a variety of compounds, including the tri- and tetra-halides such as NpF3, NpF4, NpCl4, NpBr3, and NpI3. Neptunium oxides such as Np3O8 and NpO2 as are also found in the uranium-oxygen system. Neptunium hexafluoride, NpF6, is volatile like uranium hexafluoride. 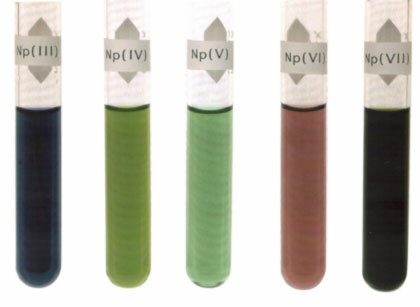 In solution, neptunium exhibits five oxidation states, III, IV, V, VI, and VII with the V state being the most stable. The solution ions of III and IV are the simple ions, Np3+ and Np4+. Similar to its uranium counterpart, as the charge on the neptunium ions increases, it is distributed over a larger oxy-cation. Thus Np(V) exist in solution as NpO2+, Np(VI) exits as NpO22, and Np(VII) is an oxy-cation with a structure probably including hydroxide ions since it is only stable in strongly basic solutions. These latter oxygenated species are in contrast to the rare earths which exhibit only simple ions of the (II), (III), and (IV) oxidation states in aqueous solution. In solution, Np(III) is easily oxidized in air to form Np(IV). Np(VII), stable in basic solutions quickly reduces to Np(VI) if the pH is made more acidic. In acid solutions, Np+3 is dark blue-purple; Np+4 is grass green; NpO2+ is emerald green; NpO2++ is light burgundy and Np(VII) is dark green in strongly basic solutions . Neptunium, forming dioxo-neptunyl ions (NpO2n+) in its 5+, 6+ and 7+ oxidation states, which readily complex with hard oxygen-donor ligands such as OH–, NO2–, NO3–, and SO42–, and CO32– to form soluble anionic complexes. With the most stable isotope of neptunium, 237Np, having a half-life of about two million years, all the neptunium present during the formation of the Earth (4.5 billion years old) has long since decayed away by now. However, trace amounts of the neptunium isotopes neptunium-237 through neptunium-240, are found naturally in as decay products from transmutation reactions (neutron activation) in concentrated uranium ores. 237Np can be produced by the "milking" as a result of the alpha decay of 241Am. As noted above, neptunium-237 is currently extracted in kilogram quantities from spent nuclear fuel rods. Discharges of neptunium from reactor plutonium production is only 5% of that of plutonium but still amounts to more than fifty tons per year. Because neptunium-237 (half-life 2.14 million years) decays to a strongly radioactive and short-lived protactinium daughter (half-life 26.9 days), an equilibrium is established that can be used to determine the amount of time since the neptunium was last separated and purified in interdicted or illicit samples. Neptunium-237 is used as a component in devices for detecting high-energy (MeV) neutrons. Neptunium-237 is irradiated with neutrons to create 238Pu, an alpha emitter for radioisotope thermal generators for spacecraft and military applications. 237Np captures a neutron to form 238Np which beta decay with a half-life of two days to form daughter 238Pu. Neptunium is fissionable, and could theoretically be used as fuel in a fast neutron reactor or in a nuclear weapon. With the long half-life of neptunium-237, handling this isotope should cause little concern for exposure, however the decay product of 237Np is highly radioactive 233Pa (half-life 26.9 days) which has a very energetic beta particle which can penetrate gloves, paper and human skin. Therefore handling neptunium materials should be the same as handling more radioactive elements. Neptunium has no particular biological role. It is not absorbed by the digestive tract. When injected into the body, it accumulates in bones, from which it is slowly released. With the long half-life of its common isotopes and the mobility of the NpO2+ ion in the environment, neptunium and its decay products are a concern in long-term nuclear waste isolation and storage. Zenko Yoshida, Stephen G. Johnson, Takaumi Kimura, and John R. Krsul (2006)"Neptunium", Chapter 6 in The Chemistry of the Actinide and Transactinide Elements, Third Edition, L. R. Morss, J. Fuger, and N. M. Edelstein, Eds., Springer Publishers.